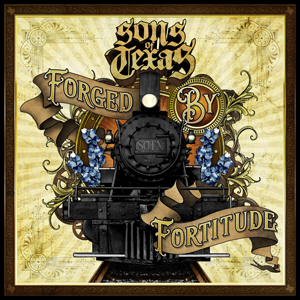 It doesn’t seem that long ago that I stumbled upon SONS OF TEXAS and their debut release, Baptized In The Rio Grande on Razor & Tie and was immediately immersed in the relentless, abusive, swagger-laden sounds of the South-Texas quintet. Once I caught wind of their follow-up release, I knew I needed to get my hands on it. After teaming up with producer Josh Wilbur of LAMB OF GOD fame in January of this year, the boys from McAllen, TX are about to release a sharpened, deep and aggressive offering that expands on the sound of their debut album – no sophomore slump here. The proverbial door is kicked down with the opening track, “Buy In To Sell Out”. Vocalist Mark Morales surprises the listener with his guttural growls – something that was absent on the previous effort. My immediate reaction was – PANTERA - this sounds an awful lot like The Great Southern Trendkill. Who wouldn’t want to be compared to PANTERA? Next up is the lead single “Feed The Need”, which comes across as a little more sonically refined, although unapologetic - a testament to life on the road and the efforts put into keeping the spirit alive in a touring band these days. The twin guitar attack of Jon Olivarez and Jes De Hoyos will satisfy your metal palate in all of the right places. Jes can deliver the goods with chunky; crushing riffs and bring tears to your eyes with his blues-influenced, soulful solos. This is particularly noticeable on the second single, “Beneath The Riverbed”. Compared with the debut record, drummer Mike Villarreal is less careful and has more of a tendency to cut loose on his fills, which only adds to the bigger, heavier, more aggressive progression from Baptized In The Rio Grande to Forged By Fortitude. This is complimented by the intricate bass play of Nick Villarreal. It is hard for me to express just how ballsy this record is, especially for a band still in its infancy – having just formed in 2013. It is sophisticated, soulful and chalked full of big southern flare, blazing guitar solos, aggressive riffs and to borrow a line from Seinfeld, “unbridled enthusiasm”. Forged By Fortitude is exactly what the hard rock and metal world needs. Grab your copy of Forged By Fortitude in he KNAC.COM More Store right HERE.